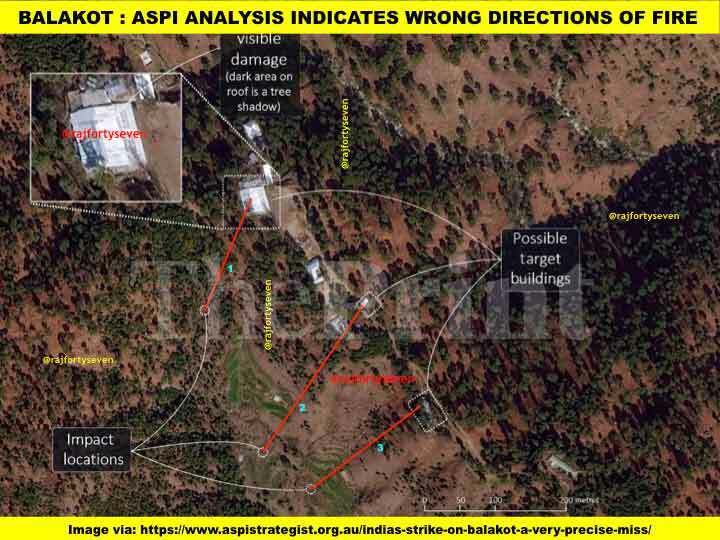 New Delhi: A month after India’s air strikes on a Jaish-e-Mohammed camp in Balakot, Pakistan, the Australian Strategic Policy Institute (ASPI) has claimed that the Israeli-origin SPICE 2000 bombs used by the Indian Air Force missed their targets because the IAF incorrectly programmed the smart bombs. However, the ASPI’s analysis is inherently flawed, and seems based on illogical assumptions. ThePrint takes a close look at ASPI’s analysis and the satellite images it has used to explain the anomalies and the incorrect conclusions. 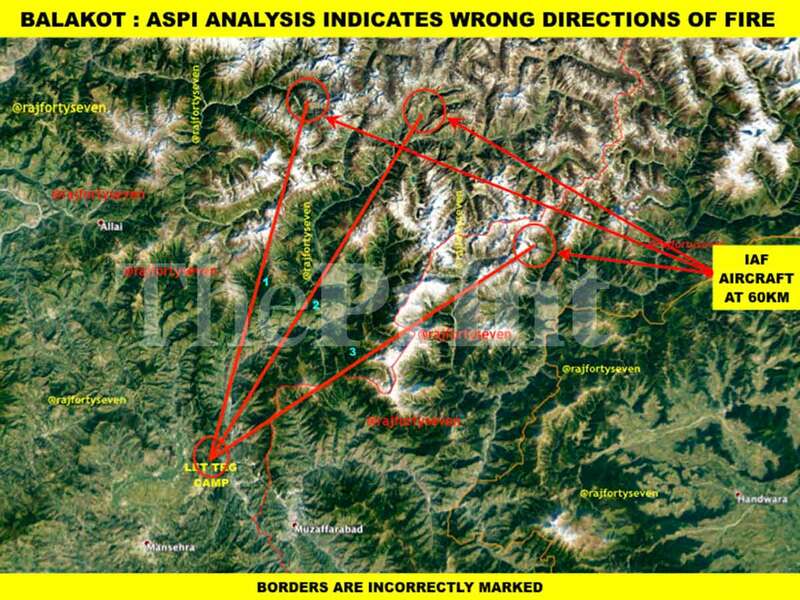 The biggest mistake committed by the ASPI authors is that they assume that the IAF did not use the correct information while feeding the GPS coordinates. The IAF would have most certainly calibrated its systems and practised such strikes many times in various environments, including using simulators. The ASPI article says that SPICE 2000 is a glide bomb and moves at an inclined trajectory, due to an exact error of 33m in the datum or information fed into them, the bombs fell elsewhere. This is an illogical assumption since the JeM terrorist training camp at Jabba Top is located in a thickly-wooded forest with coniferous trees, which have grown much above the buildings (tree shadow indicated in the article). 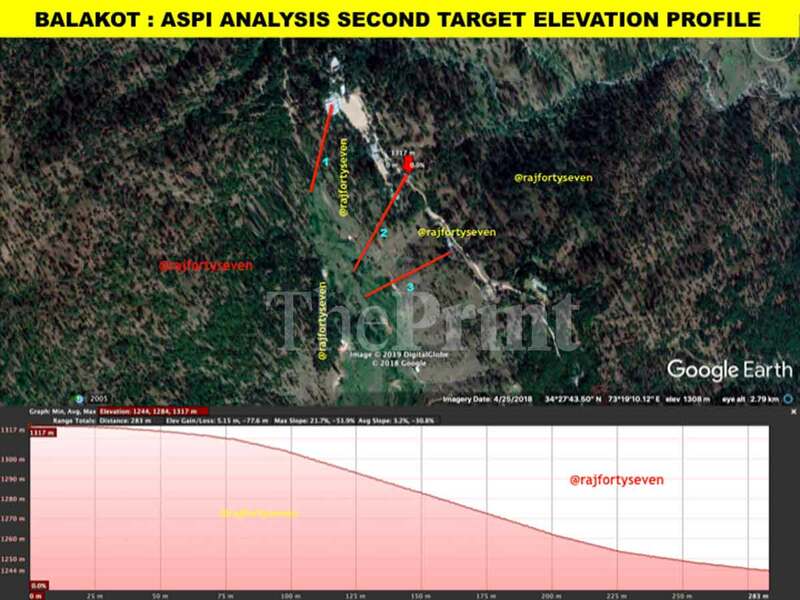 It is incorrect to presume that IAF would have used an Angle of Impact anything below 80º to hit the designated targets in such a thickly-forested area. The guidance system of the bombs used in this operation is not only based on GPS coordinates, but also on aerial photos and satellite images that are fed into the system as target information. This duplication system of feeding target information increases redundancy, and thus increases the hit probability. The ASPI researchers have also changed the targets from their earlier report. The reasons for the same have not been explained in the new report. The length of the line denoting information difference in height has also been adjusted very clearly. The purpose of the changes made have not been explained anywhere either. The elevation profile of the changed target clearly indicates that in such information difference of 33m, the impact location would have been further away. The target and length of information difference seems to have been changed on purpose, to ensure the angle of trajectory matches the trajectory drawn for other targets. The only explanation for these changes is in order to modulate the data to match the analysis, which is a sign of shoddy research. 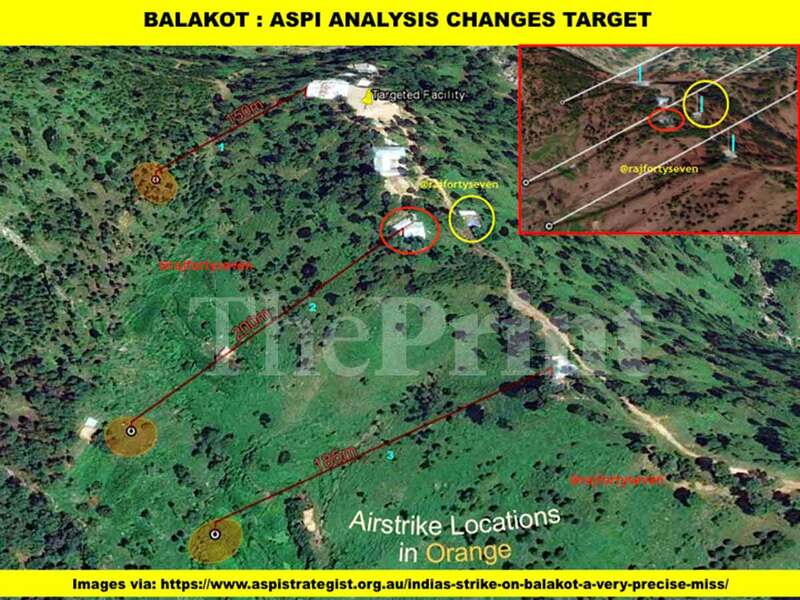 The analysis joins the lines of the possible targets and supposed impact locations and extends them to the IAF aircraft at a distance of 60 km, revealing surprising details. The direction of fire, the analysis claims, is from 197º to 240º, which when extended to 60 km, indicates that the location of the aircraft would be much within Pakistan’s territory, without any valley to move along in a nap-of-the-earth (NOE) manner — a kind of flying where geographical features are used as cover. The three directions of fire the researchers propose, when plotted on Google Earth, would mean that the distance between the first and third aircraft was almost 45 km — which is impossible. Air force aircraft move in particular formations during operations, and can never be 45 km apart in enemy territory. The researchers’ assumption is, therefore, far removed from the reality of a professional force like the Indian Air Force.